This challenge is hosted by Kathryn at Book Date. Complete the card below. You can do it in any order you wish. You are allowed "one free exchange", if there is something on the square you really dislike you may change it to something of your choice. Once you have played this free card that is it. Mention the exchange in the final summary post. 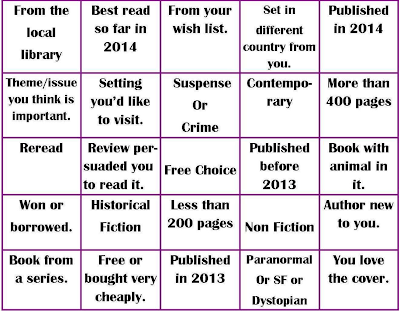 One book per category, no crossover within the challenge - so 25 books in all. However books can crossover from other challenges. Questa sfida è ospitata da Kathryn del blog Book Date. Completate la tabella qui sotto, nell'ordine che preferite. Avete la possibilità di cambiare una casella che non vi piace con qualcosa che preferite, ma solo una volta. Nel post a sfida terminata fare riferimento a questo cambio. Un libro vale solo per una categoria, sono quindi 25 i libri da leggere in tutto. I libri di questa sfida possono valere anche per altre sfide (e viceversa). 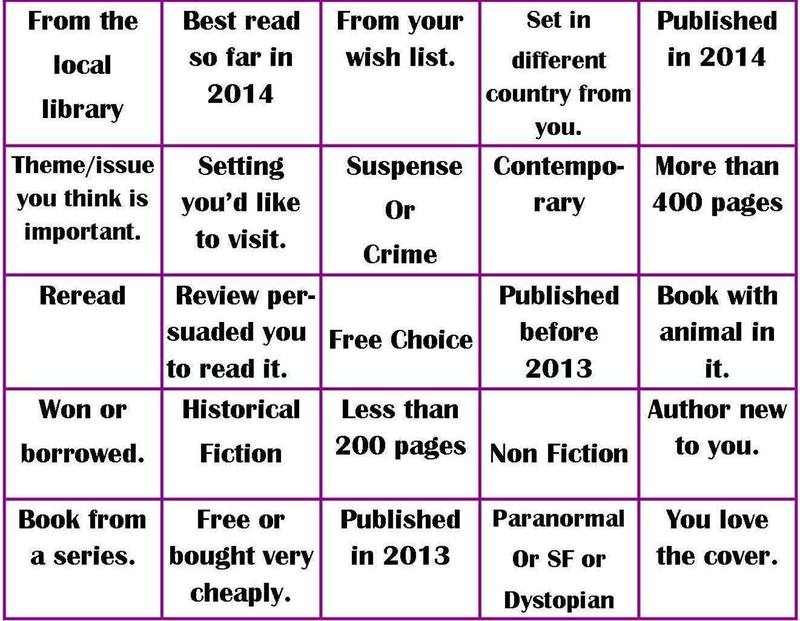 Thanks for signing up to the challenge, I hope you enjoy it and have a great 2014 reading year.